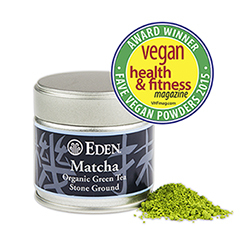 Clinton, Michigan – EDEN Matcha stone ground green tea powder is a recipient of Vegan Health & Fitness magazine's 'Fave Vegan Powders' award. The acknowledgement is featured in the September/October 2015 issue. Vegan Health & Fitness wrote, "Eden's Organic Matcha Green Tea Powder has been selected as a winner of our 2015 Fave Vegan Powder Awards in Vegan Health & Fitness Magazine! A big congrats to you! We absolutely LOVE the stone-ground, rich green tea flavor and awesome mind-body purification benefits. Our health-obsessed readers will go totally ga-ga over it for sure!" Organic EDEN Matcha is the finest, hand harvested, stone-ground, ceremonial grade powdered green tea. It is absolutely delightful and invigorating. Unlike brewed teas that are steeped and then discarded, when you take Matcha the whole leaf is consumed, whisked into warm/hot water for concentrated green tea benefits. Research points to green tea's antioxidant 'catechins' (40% of matcha's dry weight) for numerous valuable virtues. L-theanine, a non-protein amino acid of green tea, enhances learning and mental ability while simultaneously causing soothing relaxation and invigoration of our bodies. Take a few moments for the delights of EDEN Matcha green tea. It is a beverage that refreshes both mind and body. It awakes the senses, purifies the body, and lifts the spirit. It is , and EDEN Pure & Purifying™. Eden Foods is a 47 year principled natural food manufacturer offering more than 400 authentic, organic, traditional, pure foods. All are superb pantry fare. Further information and over 1,130 free recipes are at www.edenfoods.com. Retailers, institutions, and co-ops, please visit us at access.edenfoods.com.